What’s the difference between an innovation and a gimmick in literature? An innovation expands the author’s vision while a gimmick tries to hide his lack of one. 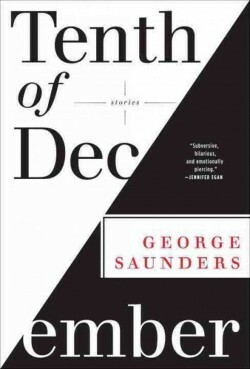 You’ll find excellent examples of both in George Saunders’ recent short story collection, Tenth of December. language that is faulty or inadequate, usually because the narrative voice belongs to a person with whom Saunders has not shared his gifts as a writer. characters who are teetering on the edge of economic / social / psychological / personal failure confronting other characters who enjoy extraordinary success (no one seems to occupy the middle ground). the motif of fictional pharmaceuticals that can regulate every human characteristic. strong satiric impulses balanced by great empathy for his characters. One of the best stories in Tenth of December is “Escape from Spiderhead” in which Saunders slowly reveals to us that the narrator is being used as an unwilling test subject for powerful drugs because he has been convicted of murder. Here words are deformed by bureaucrats and scientists, who use technical language to obscure the horror of their actions, and Saunders deploys his innovative premise to deliver a knock-out meditation on free will, regret, and redemption. Another excellent story is “Victory Lap” which tells the anxiety-provoking tale of a high school girl, the middle-aged man who attempts to kidnap her, and a high school boy who intervenes. Saunders nails the voices of all three characters. The kidnapper narrates the pathetic execution of his pathetic fantasy to perfection, but it is the teenagers who really shine. Their words grasp at ideas and emotions without quite seizing hold of them, and you get the sense in the end that Saunders intends the triteness of their language to be a deliberate defense against the fear they experienced. In these examples, the innovations – the science-fiction premise of “Spiderhead”, the conspicuously stylized narration of “Victory Lap” – work with the other elements to create stories that capture your mind, your heart, and your gut. But that’s not the case for every story in Tenth of December. For example, “Exhortation” is a staff memo composed of inept motivational business-speak wrapped around the message that the department will all be fired unless performance measures improve. “My Chivalric Fiasco” is mostly about what happens when a worker at a Renaissance-Fair business takes a drug that makes him a highly articulate speaker of ersatz medieval dialect. Other than admiring Saunders prose, or nodding in automatic agreement at the obvious lessons (offices are insane places in “Exhortation” and sexual harassment is bad in “Fiasco”), there is little for the reader to do. The gimmick of the style doesn’t hide the thinness of the story. The longest piece in this collection, and I think the weakest, is “The Semplica Girl Diaries”. The story is told through the diary of a man who plunges his family from serious money problems to desperate money problems by making an expensive, impulsive, and useless purchase. This purchase happens to be (as is eventually revealed to us) four young girls from poor countries who hire themselves out as living lawn ornaments. As a big honking obvious metaphor for the exploitation of third-world labor by Americans, you would be hard pressed to find a metaphor bigger or more honking or more obvious. Once Saunders shows the metaphor to you, however, there is not much left. You can enjoy the gyrations of the story. I didn’t. You can admire his prose style. I did. But virtuosity alone is never enough to satisfy me. It has to be in the service of something other than itself. Don’t let this stop you from reading Tenth of December. The rewards outweigh the frustrations, and your effort will be entirely redeemed by its best and shortest story, “Sticks,” in which a man tries to connect with his family by decorating a metal pole in their yard with clothes and words. Here Saunders does more in two pages than many writers can do in one hundred. And that’s neither innovation or gimmick. That’s talent.